The Navajo Nation got coal for Christmas this year – literally. On December 30, a Navajo tribal corporation finally completed its drawn-out purchase of the Navajo Mine, the sole supplier of coal to New Mexico’s Four Corners Power Plant. Depending on whom you ask, this is either a historic milestone for tribal energy independence, or a soon-to-be millstone hanging around the tribe’s neck. Let’s consider the naysayers first. A young protester outside the Navajo Nation council chambers in October. Courtesy Emily Guerin. Finally, many opponents say it’s simply a bad time to be buying into the coal industry. Coal-fired power has historically been the largest source of electricity in the country, but that’s changing as natural gas increases in popularity and EPA regulations clamp down on air pollution from coal plants. According to the Energy Information Administration, coal, which made up 37 percent of electricity generation nationwide in 2012, is expected to drop to 32 percent by 2040. “The coal industry is on the decline and that’s what the Navajo Nation needs to realize,” says Jihan Gearon, the president of the Navajo environmentalist group Black Mesa Water Coalition. Now let’s turn to the other side. 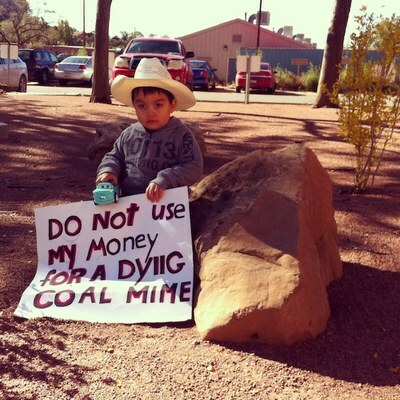 If the Navajos didn’t buy the mine, Four Corners wouldn’t have a secure coal supply, and would likely close in 2016. While that would be good news for fighting climate change and for the respiratory health of people living around the plant, it would seriously disrupt the local economy. If the plant closed, the Navajo Mine would close, too, putting more than 800 employees, mostly Navajo, out of work. In addition to preserving hundreds of jobs, keeping Four Corners open means tens of millions every year for the Navajo tribal government. The mine purchase is also a pretty big deal for tribal sovereignty. The Navajos have sought greater control over their natural resources for a long time, but previous bids to build their own energy projects, like the Desert Rock coal-fired power plant, haven’t worked out. It’s pretty hard to get a tribal-run energy project built: as sovereign nations, tribes aren’t eligible for certain renewable energy tax credits and overlapping bureaucracy means project permitting can take forever. Given these hurdles, any time a tribe has a chance at ownership, they should take it, says Roger Fragua, a tribal energy consultant and member of the Jemez Pueblo. As owners, the Navajos have much more say in the mine’s future operations – exploring coal gasification or exporting to China, for example – than they have had as leaseholder for the past half-century. And in theory, a tribal corporation should make decisions that benefit tribal members, not distant shareholders or CEOs. “Of course we’d rather have Navajo Nation control its own resources,” says Fragua. “I’d much rather have them than Peabody Coal,” or another large mining company. 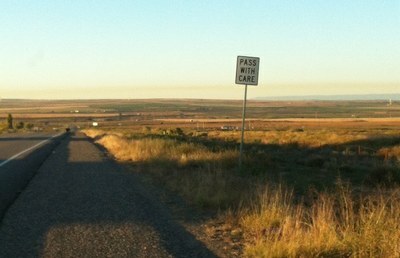 A band of yellow smog drifts from New Mexico's Four Corners Power Plant, which is out of view. Photograph by Emily Guerin. Some opponents wonder whether the mine purchase will only deepen the tribe’s dependency on coal, an industry that supplies a third of its annual budget and employs thousands of people. But Chris Deschene, a Navajo attorney involved in the Desert Rock project and former Arizona state representative, doesn’t see it that way. “If you are leasing out your resources and having somebody else develop them and they are generating the lion's share of the profits and paying you cents on the dollar – and you’re accustomed to that – that’s a measure of dependency,” he says. Emily Guerin is a correspondent for High Country News. She tweets @guerinemily. Look for her forthcoming feature story on the future of coal on the Navajo Nation.